A Baltimore teenager who turned himself in after smashing a police car during last month’s unrest was finally released, after community and donors raised the $500,000 bail, set higher than for any of the officers charged in the death of Freddie Gray. 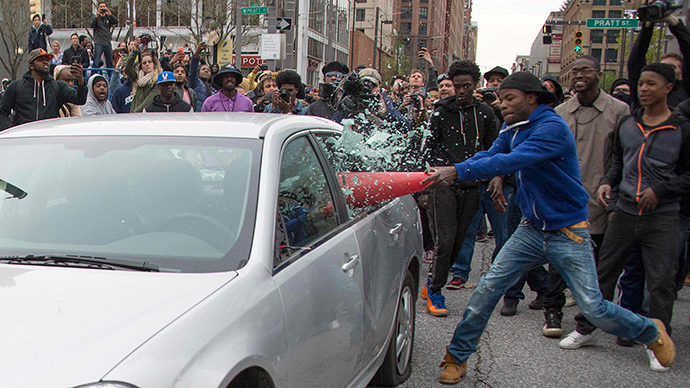 Allan Bullock, 18, was photographed using a traffic cone to smash the windows of a Baltimore PD car during the April 25 protest outside Camden Yards baseball stadium. Bullock turned himself in four days later, on the advice of his parents, after a state of emergency was declared following the April 28 riot. To the chagrin of Bullock’s family, a Baltimore district judge set his bail at $500,000. Later that week, the state attorney charged six Baltimore PD officers in the wrongful death of Freddie Gray, with the highest bail set at $350,000. Despite the efforts of public defenders and advocates to lower the bail amount, the authorities would not relent. Eventually, community activists and donors from around the world scrounged up the funds to cover the bond. The teen was released Thursday. “He’s got a ton of family support. He’s got a ton of community support. Many from around the country and the world are supporting this young man,” Bullock’s attorney Brandon Mead told the Baltimore Sun. Thanks to @Bmore_United & #Baltimore Legal Defense, Allen Bullock is free on bail! Thanks to all who supported, but we must remain vigilant. Bullock’s bail has been criticized as an example of law enforcement’s bias in the treatment of African-Americans. The eight misdemeanors he was charged with were his first criminal charges as an adult. One of the offenses, rioting, carries a maximum sentence of life in prison. “I think the $500,000 he’s released on is an example of the arbitrary and capricious nature of our bail system,” said State Delegate Jill Carter, a Baltimore Democrat, who met with Bullock after his release. “Freddie Gray will never be back. Those windows will,” Mckesson told CNN’s Wolf Blitzer. Gray, 25, was arrested on April 12, because he ran away from police after “making eye contact.” Later that day he was admitted to the hospital with his spine severed at the neck. After a week in a coma, Gray passed away. On April 27, the day of his funeral, clashes between police and high-school students in West Baltimore escalated into a riot.